Can someone help me understand how to derive the implied interest rate or spot rate in BBG FXFA? I actually get why the Forward rate, F_Ask and F_Bid are derived using the formula in the picture. The problems are the other formula. 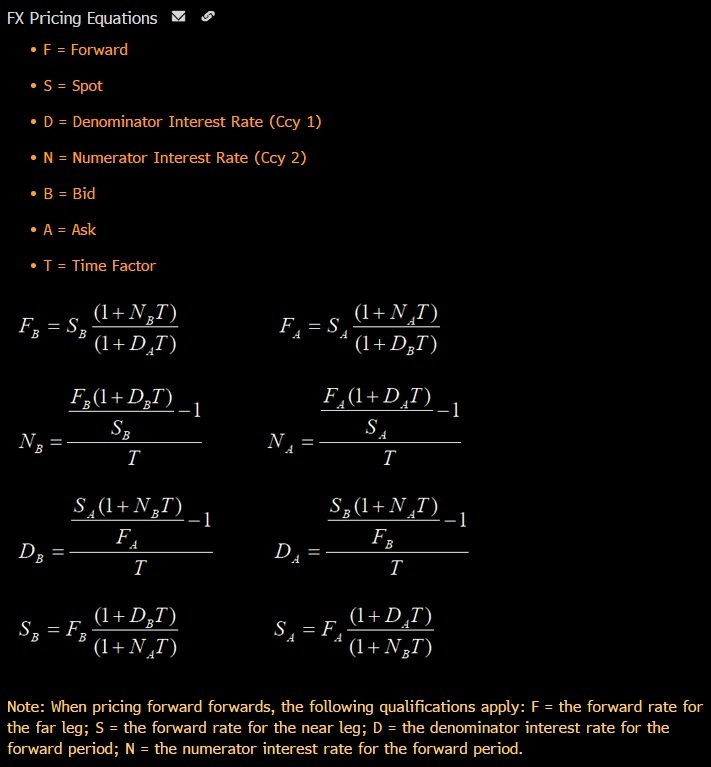 I thought by rearranging the terms in the implied forward rate I can get the implied rate for AUD or USD or spot. But it appears the bid/ask need to be twisted as well. Can someone help me with this? Probably using N_Bid formula as an illustration for its economic meaning. As a result, there are three sources of bid/offer cost for a forward. In contrast, for an interest rate, it's just one transaction (borrow or lend). This is why they twist those equations. They are trying to isolate the amount of the bid/offer attributable to that one source. There will may be a gap between the implied interest rates and what you see for interest rate swaps. Reading about coss currency basis swaps may be of interest to you see here for example. I don't currently use a Bloomberg Terminal, but I think the command to see some of the cross currency basis levels is XCCY. The above info is for educational purposes only, not investment advice. Not the answer you're looking for? Browse other questions tagged interest-rates fx forward-rate spot-rate implied or ask your own question. When calculating CIP between EU and US, which interest rates data to use? How to work out the forward outright price from the bid/ask quotes?